Gathering on the 17th floor of New York’s luxurious Hotel Plaza Athenee on Friday, August 15, a small crowd of a dozen friends and family came together to celebrate love and luck. 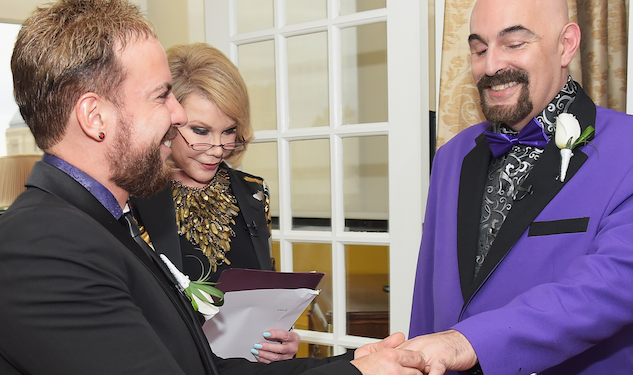 Grooms Joe Aiello and William "Jed" Ryan never expected their wedding to play out as it did. Because of a cheeky sense of humor and the gratitude of the ever playful Joan Rivers, however, they managed to turn an impromptu joke into an evening they will never forget. The two made headlines earlier this summer when, on June 30, they hatched a plan to tease their icon, Joan Rivers, at one of her book signings. After reading in her book that Joan had previously presided over a friend’s wedding, Joe and Jed decided that they would jokingly ask Joan to marry them when they got a chance to speak to her. Having moved in together in February, the couple was planning to get married in the next couple of years and did not expect Joan to take their request seriously. However, to their surprise, Joan called their bluff and offered to marry them on the spot. Despite the joke not going as planned, the couple agreed and the video (below) of their surprise ceremony quickly went viral. As Jed shared with Out, “You can’t say no to Joan Rivers!" However, when Rivers heard that the couple did not have a marriage license at the time and thus were not officially married, she quickly set about arranging a second ceremony where they could legally tie the knot. As the two stood looking into each other’s eyes over the backdrop of the Manhattan skyline, Joan brought her own trademark flair to the officiation. Opening by saying that “I hadn’t planned on marrying anyone else, except for maybe Britney Spears, because I’d love to hear her lip sync her vows,” River’s acerbic style brought tears of both laughter and joy to the eyes of the audience as the grooms became husbands.